Dallas, TX is the third major city in the state of Texas and makes up the northern point of the Texas Triangle between Dallas, San Antonio, and Houston. When combined with nearby Fort Worth and Arlington, Dallas has the fourth largest metropolitan area in the country with the sixth largest metropolitan economy. The city itself is the ninth most populous city in the United States and it has played an important role in American culture and history. The city of Dallas started as a cotton farming town and developed quickly in the late 1800s as multiple railroads were built connecting Dallas to Houston and other cities in Texas. Dallas and the surrounding areas now have one of the highest concentrations of corporate headquarters in the U.S. and its resilient real estate market continues to attract residents to the city proper and nearby cities such as Irving, Arlington, and Fort Worth. If you live or work in Dallas, TX, it is helpful to know that there are trusted professionals that provide the city with disaster restoration and cleaning services to keep your home and your office maintained and protected from disasters such as fires and storms. Dallas has relatively mild weather throughout much of the year but the spring season has the perfect storm of cold fronts from the North and humid air from the Gulf Coast that collide to form rain, thunderstorms, and tornadoes. These weather conditions are a major threat to damage property with flooding and strong winds but there are reliable professionals in the Dallas area that can restore your home or office with water damage restoration services. These professionals react quickly to water damage emergencies and will completely remove all excess water or moisture from your home or property. You should call for water damage restoration immediately because the excess water will continue to spread throughout the home or building and could even cause mold. A fire can happen practically without warning and the above average temperatures along with the below average precipitation of Dallas create a dangerous environment for fires to thrive. A home or building can sustain extreme damage very quickly from a fire and the damage can continue to spread after it is extinguished from the corrosive byproducts and chemical emissions left behind. It is important to call for fire damage restoration services in Dallas immediately to help limit and restore the damage caused by fire and smoke. The trusted fire damage restoration experts in the Dallas area will help rebuild and restore your home or office following a fire. Dallas is located at the southern end of Tornado Alley and there is always a risk of tornadoes in the area. However, most of them usual aren’t strong enough to cause any significant damage. After a fire, flood, or other disaster, there is a chance that your home or office may have an odor lingering from the damage. Unpleasant odors in a home can also be caused by a natural source such as pets and dead animals and the Dallas heat will only make these odors more unbearable. There are trained professionals in the Dallas area that provide deodorization services to completely remove a variety of strong odors from homes and buildings. These professionals will remove the smell as well as its source using advanced equipment and technologies and they will also ensure that the odor does not return. Dallas is best known for its hot weather as dry winds from the north and west raise the summer temperatures, making the Dallas area one of the hottest spots in the U.S. This warmth carries over into the mild winters which experience an average temperature of about 50 ˚F and occasional cold fronts referred to as “Blue Northers” that can drop the temperature below freezing. The annual snowfall in Dallas is quite low with an average of 1.5 inches a year but the city does experience freezing rain and ice in the winter when the warm air from the south collides with cold air from the north. The freezing rain and ice creates dangerous driving conditions and can contribute to property damage. The Dallas Arts District stimulates the economics and culture of Dallas. The spring and fall seasons in Dallas experience mild temperatures but they also have a tendency for severe weather such as thunderstorms and tornadoes, especially in the spring. Dallas is located in the middle of Tornado Alley where cold dry air from the north collides with warm dry air from the southwest and warm moist air from the southeast to create the right conditions for heavy rain, thunderstorms, hail, and tornadoes. It is important for homeowners and business owners in the Dallas area to be prepared for severe weather in the spring and fall and contact a professional for disaster restoration services if you experience storm or flood damage. Dallas is a diverse city that contains many neighborhoods and districts with their own distinct cultures and several areas have undergone recent development and gentrification to attract more residences and businesses. The city is divided into three main communities that each contain several neighborhoods; Central Dallas, East Dallas, and South Dallas. Central Dallas contains the downtown area as well as neighborhoods with plenty of shopping destinations and an active nightlife. Downtown Dallas has been growing strong for the past decade and now encompasses 15 of the city’s districts. The Munger Place Historic District in Dallas, TX – a historic neighbouhood, the place is also listed on the National Register of Historic Places. Historically, East Dallas has been an artistic hub in the city and it is still home to Dallas’s trendiest neighborhoods including Deep Ellum and Munger Place. Deep Ellum was a popular spot for blues and jazz in the 1920s and 30s with artists that included Robert Johnson and Bessie Smith and it remains a center for trendy arts today with several art studios and concert venues in the neighborhood. The historic district in the Munger Place neighborhood is known for its many prairie-styled homes with architecture influenced by Frank Lloyd Wright. 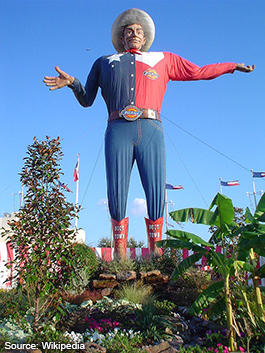 Big Tex at the State Fair of Texas. South Dallas has experienced the most extensive recent gentrification and development that have transformed it from a low-income and high crime area into a popular destination for its nightlife. This area has several venues that attract people from around the city such as the NYLO roof top patio and lounge and the country bar Gilley’s. South Dallas is also home to some of the most ethnically diverse neighborhoods in the city. Dallas has come a long way from its beginnings in cotton farming and it is now a center for communications and engineering as well as the home of the highest concentration of corporate headquarters of publicly traded companies in the nation. It had the largest year-over-year increase in employment in 2013 which made it the fourth largest job market in the U.S. trailing only Chicago, Los Angeles, and New York. Dallas rose to prominence in the early 1900s as one of the world’s largest cotton markets and became the center of the U.S. petroleum market when oil was discovered near Dallas in the 1930s. It has been a center for communications and engineering ever since the end of World War II. The strong presence of telecommunications companies in Dallas has led many to call it the heart of the “Silicon Prairie” in Texas. Over 5,700 technology and communication companies are located in the nearby suburb of Richardson in a region known as the Telecom Corridor. These companies include Texas Instruments, AT&T, Ericsson, Nokia, Sprint, Verizon Communications, Cisco Systems, and many more. AT&T and Texas Instruments are two of the three largest employers in the Dallas area. The high concentration of corporate headquarters in Dallas includes a range of different companies including 20 Fortune 500 companies over the entire Dallas – Fort Worth area. The biggest Fortune 500 companies headquartered in the Dallas area are ExxonMobil, Kimberly-Clark, and Commercial Metals. Other notable companies with headquarters in the Dallas area include Radio Shack, 7-Eleven, Southwest Airlines, American Airlines, Mary Kay Cosmetics, HP Enterprise Services, Frito Lay, and JC Penney. The development and gentrification of Dallas’s neighborhoods along with their expanding job market has made the city an attractive place to live and work. If you have a home or office in Dallas, it is useful to know that there are residential and commercial cleaning services available to help you keep your home or office maintained. One of the keys to keeping a clean living or working space is to make sure that your carpet and hard surface floors are clean to maintain their appearance and preserve their life. Service providers that offer professional carpet cleaning in the Dallas area can thoroughly clean any style carpet in commercial and residential settings to restore their appearance. If your home has hard surface floors such as tile and grout, then you know dirt and mildew can gather in the grout lines and give the tiles a dull appearance. Professionals that provide tile and grout cleaning will safely remove the built up dirt and mildew from the grout lines and clean the surfaces of the tiles to restore its original shine. By restoring the look of your carpet and hard surface floors in your home or office, you will improve the interior appearance and help create a healthier living and working environment. Dallas and the surrounding areas in the Dallas – Fort Worth Metroplex have no shortage of interesting activities and events from the performing arts to a variety of museums and other notable places of interest. Art District: The Art District is a section of downtown Dallas that contains several art museums including the Dallas Museum of Art as well as venues for the performing arts such as the Morton H. Meyerson Symphony Center which is where the Dallas Symphony Orchestra and Dallas Wind Symphony perform. The AT&T Dallas Center for Performing Arts is also located in the Art District and it includes the Winspear Opera House where the Texas Ballet Theater and Dallas Opera perform and the Dee and Charles Wyly Theatre. Museums: Dallas has several art museums located within the city including the Dallas Museum of Art, The Trammel and Margaret Crow Collection of Asian Art, and the Nasher Sculpture Center. The Dallas Art Museum was established in 1903 and currently houses over 24,000 pieces including contemporary art and pieces as old as the third millennium BC. Other notable museums include the Perot Museum of Nature and Science and the Meadows Museum which has one of the largest Spanish art collections in the U.S.
Dealey Plaza and the Sixth Floor Museum: Dealey Plaza is a notable location because it was the scene of one of the most infamous events in American history and there is now a memorial and museum to commemorate the event and John F Kennedy’s life and legacy. The sixth floor of the former Texas School Book Depository, now the Dallas County Administration Building, is a museum which includes artifacts, films, and photographs analyzing the Kennedy assassination. The area of Dealey Plaza near where the assassination took place was designated as a historic landmark in 1993 with a plaque commemorating its significance. Zoo and Aquarium: The Dallas Zoo is one of the most popular attractions in Dallas and the oldest zoo in the state of Texas. It was established in 1888 and it now houses over 2,000 animals in their 106 acre park. The Dallas World Aquarium is another popular zoo in Dallas and it participates in a cooperative breeding program with other zoos to help with the conservation of endangered animals. Dallas Events: Dallas hosts many popular events throughout the year such as the Red River Shootout and Heart of Dallas Bowl college football games, St. Patrick’s Day Parade, the Greek Food Festival of Dallas, and Cinco de Mayo celebrations. The State Fair of Texas held at Fair Park is the biggest Dallas event and a huge contributor to the local economy. Dallas Sports: There is a professional team located in Dallas or the Metroplex area for each of the four major sports in the U.S. The most popular sports team in Dallas is the Dallas Cowboys who play in Arlington. The Cowboys have been dubbed “America’s Team” and have won five Super Bowls over their time in the NFL. The Texas Rangers also play in nearby Arlington and appeared in the World Series in 2010 and 2011. The Dallas Mavericks have experienced the most recent success of the Dallas sports teams, winning the NBA Finals in 2011. The Dallas Stars are Dallas’s NHL team and have won a Stanley Cup championship in 1999. Dallas Cuisine: The most popular cuisine in Dallas generally includes, Tex-Mex, authentic Mexican, barbecue, and steakhouses. There are several notable steakhouses in Dallas including Pappas Bros. Steakhouse and Bob’s Steak and Chop House which is the top ranked steakhouse according to the USDA Prime Steakhouses chart. Dallas also has Fearing’s restaurant at the Ritz-Carlton hotel which was rated the country’s best hotel restaurant by Zagat in 2009. Complete Guide to Restoration and Cleaning Services and the Main Attractions of Washington, D.C.